Last Saturday was the third time this year I’ve gone to a college to talk about Ruby and Rails. And, as expected, the general lack of experience in developing in Windows was the main cause of problems in that whole day event. The experience wasn’t as bad as what we would have gotten had we conducted it last year, though. Installation used to be the hardest part about Rails on Windows, but thanks to RailsInstaller and RailsFTW, installing Rails on Windows nowadays is practically easier than installing it on Linux or OSX. However, another problem still remains: the lack of good text editors for Rails on Windows. The vast majority of Ruby developers don’t use IDEs, while their choice of text editors are either OS X exclusive (TextMate) or has a steep learning curve (vim, emacs). 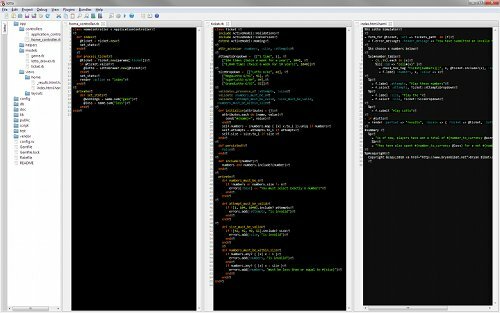 On the Windows side, Notepad++ and Crimson Editor both have dismal Rails support. Fortunately, there are a couple of good upcoming text editing options for Rails developers on Windows. Redcar is a text editor written in Ruby running on top of JRuby. It’s cross-platform and free but still in alpha. It’s heavily inspired by TextMate, and it even supports some TextMate bundles. 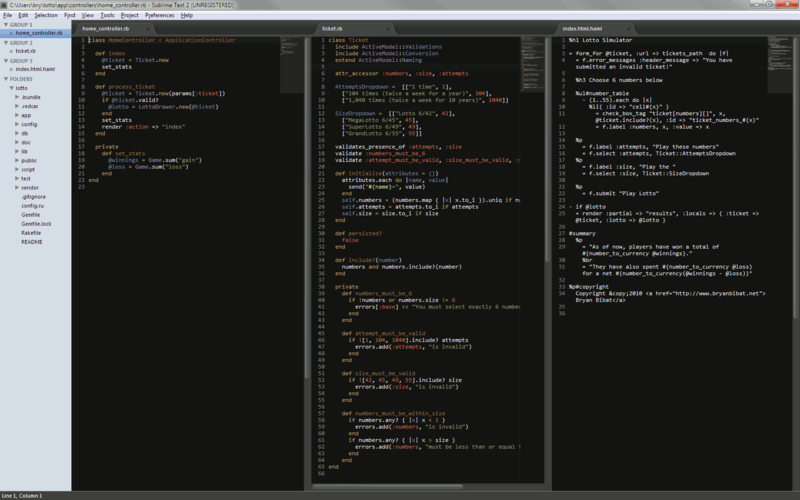 Sublime Text 2 is another cross-platform text editor. 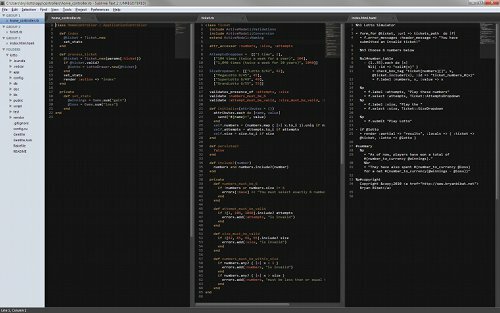 The original Sublime Text isn’t free, but the upcoming release is still free because it’s still in alpha. Sublime Text 2 doesn’t require Ruby or Java, making it more feasible to be shared around in a coding workshop with spotty internet connections (e.g. last Saturday’s event), but its eventual proprietary nature may prevent long-term development use. EDIT: Quick write-up on Notepad++ v6.0 here. I always tell the audience that Aptana and NetBeans (though the latter is discontinued) are both fine IDEs and it’s their choice whether to use them or not. However, we tend to recommend lightweight text editors (Redcar’s 35MB, Sublime Text’s 5MB) over IDEs (Aptana’s 100+ MB, NetBeans’ 80+ MB) since you won’t need a lot of IDE features when developing in Rails. Help with Redcar for windows please! Looking to use Redcar with ruby and rails. Do you have Java installed? Redcar requires Java to work. JEdit actually works out pretty decently and is entirely free. Although it’s definitely got a bunch of stuff that could be better, it can basically handle ruby syntax highlighting etc.